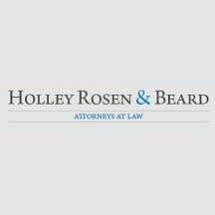 With the addition of Peter Beard, our firm name is now Holley, Rosen & Beard, LLC. Holley, Rosen & Beard, LLC is recognized as an 'A' rated law firm by the legal authority Martindale-Hubbell. A thorough understanding of the law and its practical affect on individuals is necessary for successful legal representation. The 'A' rating from Martindale-Hubbell demonstrates the quality of our firm's legal services. Holley, Rosen & Beard, LLC is committed to providing quality representation to clients of all races, ethnicity, religion and income levels. 'Straight Talk, Hard Work And Results' is not simply a slogan. It is our office's philosophy. Our lawyers listen, evaluate the facts of each client's case and keep our clients informed. A client who has information and knowledge pertaining to their case will better understand his or her options to make the best possible decisions. Each case is different, each client is different, each client has different needs, and our legal approach seeks to ensure the best results for each individual client. Our clients will have their case handled by an attorney from beginning to end. We are committed to giving our clients quality legal representation and the personal attention each client deserves.